Wife of the Vice President, Mrs. Matilda Amissah-Arthur has donated quantities of bags of rice, maize, assorted fruits, two desktop computers and school bags with educational materials to the staff and children of the Nsawam Orthopedic Training Centre in the Eastern Region. Mrs. Matilda Amissah- Arthur was taken round the facility by Mr. Raphael Amuzu Dzamashie Assistant Director of the Orthopedic Training Centre to understand how the facility operates. Mrs. Amissah-Arthur commended the hospital and staffs for the good job they have been doing, and encouraged them to do more to ensure quality health-care that Ghana needs. After the tour, Mrs. Matilda Amissah-Arthur said what she saw was an eye opener and was impressed. The Second Lady used the occasion to call on corporate organisations to support the center. Mrs. Amissah-Arthur said her coming to the Centre was a request by Father Campbell of the Christ the King Parish to come and visit and assist the facility, that trains patients how to use their orthopedic appliances and trained young people how to manufacture all the appliances needed by the physically challenged, leg braces, shoes, artificial limbs, splints, crutches, etc. As a crusader for environmental cleanliness, she lauded the authorities for a wonderful job done on the neatness and cleanness of the facility and observing strict environmental cleanliness in the hospital. She also visited the prosthetics and orthopedics education and training college, where she interacted with the principal Mr. Henry Larbi and students to acquaint herself how the school provides assertive devices for persons with physical and mobility disability and patients with orthopedic needs. The administrator of the hospital used the opportunity to thank her for her kind gesture especially in the area of providing resources for quality health care delivery in the country and urged her to continue with her good works. The Orthopedic Training Centre (OTC) was established by the Divine Word Missionaries in 1961. 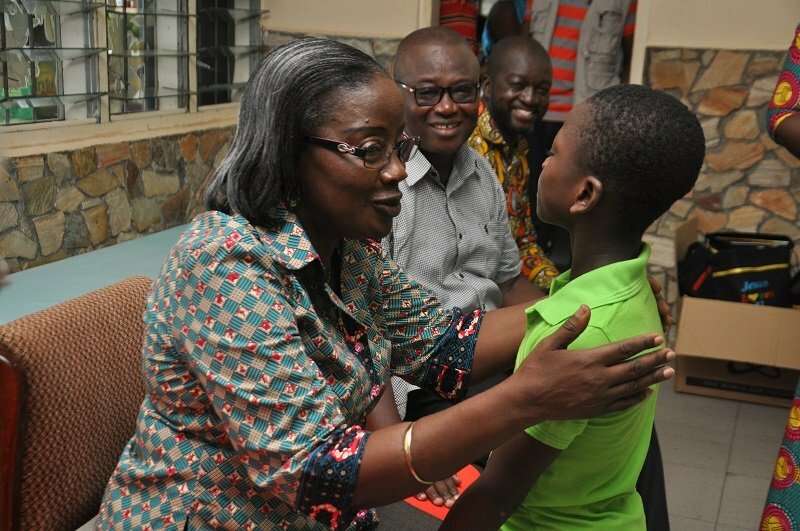 She was accompanied by the Regional Minister Mavis Frimpong and the MCE for the area.